UK Prime Minister May's comments at the Tory Party Conference over the weekend played up the risk of what has been dubbed a hard Brexit and triggered a slide in sterling saw it fall to new 30-year+ low against the dollar just below $1.2760. A stronger than expected recovery in the UK construction PMI helped sterling stabilize in mid-morning London turnover. May offered little solace to financial services industry, which accounts for about an eighth of the UK's GDP and employees well over a million people. The interim deal with the EU to allow for a smooth transition never seemed particularly likely given the EU's attitude, and May does not seem to be pushing for it very hard. Although mocked for saying "Brexit means Brexit," the meaning is becoming clearer for the government. It means that the UK voted to limit migration and ostensibly have greater say in its laws and budget in exchange for access to the single market. Ultimately that is the trade-off that May recognizes. 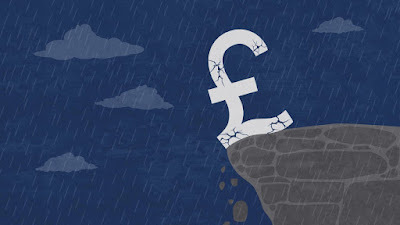 Sterling's decline is not coinciding with lower interest rates. UK shares though are doing well. This is not surprising for the FTSE 100, where the significance of foreign earnings make this a currency play, but the FTSE 250 and FTSE 350 are performing slightly better than the FTSE 100. Industrial are the strongest sector, followed by telecom and information technology. The euro is also under pressure. Recall that before the weekend; it had approached support near $1.1150 before AFP reported about a compromise over Deutsche Bank's fine. The euro is slipped back toward there despite Deutsche Bank's stock is higher today after yesterday's unification holiday. The shares dipped below 10 euros tat the end of last week and reached almost 12 euros today. The $1.1150 support may fray today. Additional support is seen near $1.1120. The euro will likely struggle to stage much of a recovery ahead of tomorrow's service PMIs in Europe and the US ADP job estimate. Many observers are attributing the firmer dollar tone to comments by Cleveland Fed President Mester, who had dissented in favor of a hike at last month's FOMC meeting. We are sympathetic to her arguments, but we cannot follow her in claiming a rate hike is compelling in November. In most circumstances, we could, but what is unusual about the November meeting is that it is a week before the national election. There is precedent to move rates in September and December of election years but not November. Given the power of this tradition, a violation would require near emergency like conditions. That is not the case. Bloomberg's calculation shows about a 17% chance of a hike in November. The CME puts it near 10%, and our calculation is a little lower. Moreover, Mester was the only Fed official to speak yesterday. NY Fed President Dudley did too, and he sounded cautious. On balance, our understanding of the decision-making dynamics gives more weight to Dudley than Mester. On the other hand, the Dow Jones Stoxx 600, the index of European large cap companies has a six-day streak to the upside, with today's 0.75% gain, led by materials and energy sectors. Asian shares moved higher but were more restrained. The minor 0.2% increase, however, masks the breadth, as all markets were higher, though Chinese markets are still closed for the week-long national holiday. The equity market gains are not preventing a firmer tone in bond markets. Yields are mostly lower. Portugal is playing a bit of catch-up today as its 10-year yield slides eight bp. DBRS is set to review Portugal's rating later this month. It is the only major rating agency that grants the country investment-grade status. If it were to lose this, it would disqualify the use of government bonds as collateral for borrowing from the ECB and their inclusion in QE.